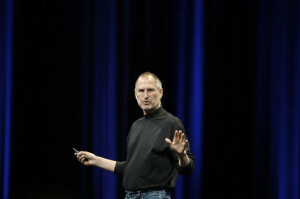 Business legend Steve Jobs died late last night. I heard about it through that most modern of news outlets: Facebook. I read the story on my company-supplied iPhone (which, by the way, I didn’t want; I’d rather use the Android that I keep in my drawer – long story). The death of Steve Jobs follows the release of the much-anticipated iPhone 4S, the successor to the iPhone 4. Perhaps that ‘S’ should stand for ‘swan song’? iPhone: user-friendly smart phone. When asked to recommend a phone to colleagues, I suggest Android for the technophiles and iPhones for the technophobes. The success of this approach tells me everything! I am not an Apple fanboy. In fact one of my favourite sports is baiting Apple fanboys. But I simply can’t help admiring this charismatic man who for so long helmed one of the most successful companies of all time simultaneously bringing design genius and technical excellence to the masses. Steve Jobs, one time living legend, your legacy will live on. Meanwhile, someone somewhere just patented the iHarp. Steve Jobs image copyright © Ben Stanfield, licensed under Creative Commons. Used with permission.